The Denon D-M33 hi-fi costs much the same as the Apple iPod Hi-Fi. At £259, the Denon D-M33 hi-fi costs much the same as the Apple iPod Hi-Fi and includes a pair of Denon's SC-M53 speakers. 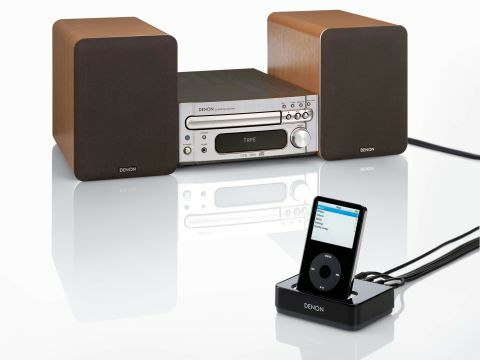 The ASD-1R iPod control dock pictured is sold separately and works with compatible Denon systems. The engineering quality is superb; there's something about handling the knobs and buttons on the machine that is quite luxurious. The sound quality is fine too, although to be honest no better than the best of dedicated iPod speakers. The bass is a bit loose, though, and the speakers distort slightly as you push the volume from any of the sources. The upper-mid level is quite detailed. If you don't want high volumes and you play mostly acoustic music or listen to the radio, and you're after a good-quality dock for your iPod, this stereo will suit your needs. The dock has twin RCA ports, one S-Video port, a control port and power-in. The control port links to the Denon hi-fi. Through this link you can control the iPod using the stereo's remote, but it's a rather convoluted set-up. First you need to switch the mode control under the dock to the correct channel, which for this system means selecting the tape channel then plugging the RCA leads into the tape-in sockets on the back of the amp. You then use the tape buttons on the remote to control the iPod. You can track skip, reverse back through the menu and select menu items. The remote has 45 buttons in total. Compared to the four-button controllers in the Group Test and dock-andplay simplicity of their designs, the Denon is overly complicated. There's also no dock connector port to sync to a Mac on the ASD-1R dock, so you can't update the content of your iPod during playback. And, of course, the whole system has zero portability. The video-out is a nice touch, however, as it enables you to supply video to your TV from a compatible iPod. The D-M33 hi-fi includes a CD player and radio receiver, both of which work very well, although there is no interplay between the two sources and the iPod. You can't load content to the iPod from either source. Considering that Apple produces a universal dock and a separate AV conversion kit, we think the Denon dock is going to be a hard sell at £75.